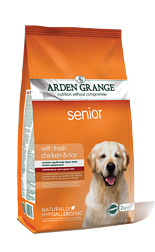 Arden Grange Senior dog food with chicken and rice is perfect for older dogs or those with a less active lifestyle. Balanced complete nutrition- corr ect levels of protein, fat, minerals and vitamins to support the dietary needs of the older dog. 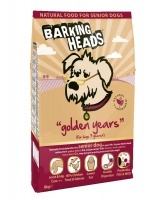 Arden Grange Senior is lower in calories which is ideal for older dogs and those requiring a less energy dense food. Added L-Carnitine may help to maintain lean body mass by increasing the conversion of fat to energy. Boosted levels of glucosamine and chondroitin to help to protect the joints during the ageing process. Boosted levels of MSM which is a natural pain killer that may also improve mental alertness and relieve stress. Arden Grange Senior may also be fed to adult dogs with a tendency to weight gain. Chicken; (chicken meat meal 22%; fresh chicken 5%); rice 22%; maize; beet pulp; refined chicken oil; whole linseed; chicken digest; whole dried egg; yeast; krill; minerals; prebiotic FOS; prebiotic MOS; glucosamine (740mg/kg); MSM (740mg/kg); chondroitin (520mg/kg); cranberries; yucca extract; nucleotides.